Ordinary watch winders are nothing new. Time to think up something extraordinary. This is the question we asked ourselves. And we have been amazed at where it has led us on this journey of development – to a watch winder whose time has now come. And we quickly found ourselves asking the next question: Why not strive for what has not yet been accomplished? So we put aside our Westphalian modesty, rolled up our sleeves, and set out on a conceptual and technical engineering journey. 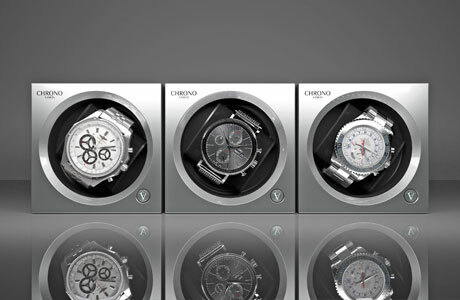 The goal: A watch winder that incorporates the achievements of all those that came before it. One that oers solutions to the current drawbacks. And that surprises with unconventional ideas and patents. 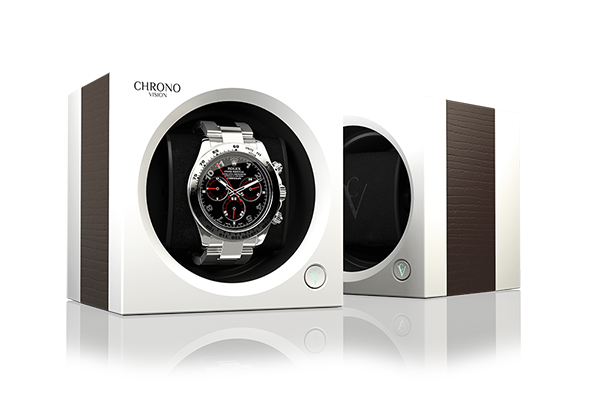 A watch winder, in which everything revolves around the fascination of premium chronographs. In short: One that simply provides the maximum amount of pleasure. We have arrived. 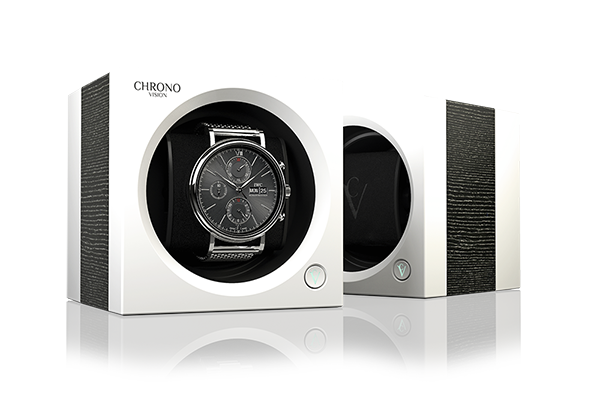 After over two years in development, countless tests, meticulous series of experiments, endless discussions, and sleepless nights, a watch winder was developed that stands out from the crowd. That is also why we called it: Chronovision One. If you are going to do it with German thoroughness, then do it right. 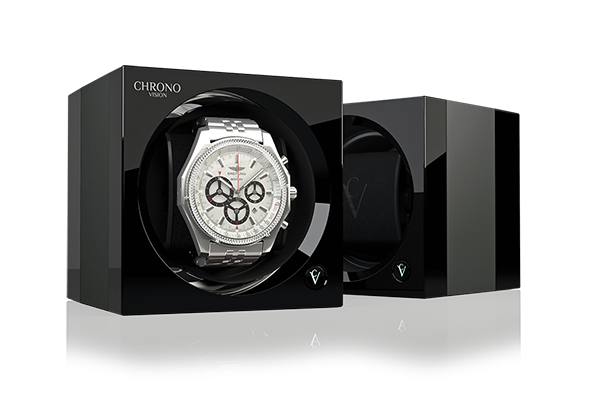 With Chronovision One, “Made in Germany” means using components that are almost completely developed and produced by regional specialists from the beautiful Sauerland region of North Rhine-Westphalia. With a lot of manual work. And even more attention to detail. The proximity to our suppliers enables a constant exchange and a close collaboration. Ideal conditions for optimization and achieving the best results. The assembly of more than 70 individual parts in over 23 individual steps then takes place in our own workshop. Incidentally, the bar set here is not only our own quality controls, but also the high German standards. But you were probably already aware of that. 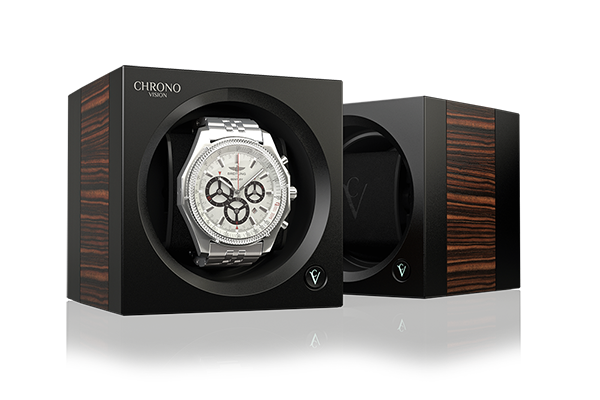 But did you know that the Chronovision One comes with a three - year warranty? 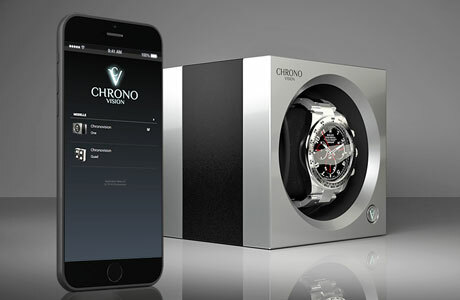 One – the unique watch winder. And so many good reasons for it. One watch, one independent motor for the rotation. That is the standard. At least in the Chronovision One. The rotations adapt to your chronographs: Clockwise or counterclockwise – and alternating directions are also possible, of course. And it is adjustable in steps of 50 – between 500 and 2,500 revolutions per 24 hours. The whisper-quiet motion stops the universal watch clasp (for women and men’s watches) at the 12 o’clock position. If your chronograph needs a little rest every once in a while, simply set the intelligent sleep phase. Any rotations that were missed will be subsequently made up in the active phase. By contrast, the rapid winding setting provides the perfect winding action for watches with a low power reserve. The device is programmed via Bluetooth®, for example, from your smartphone or via the USB connection of your computer. The software for PCs and Macs and the app for iOS and Android save the settings you have already made. 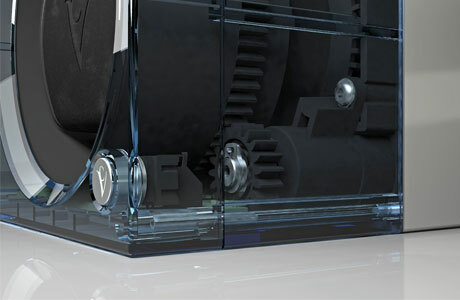 Until now, watch winders have always led a life of their own when it comes to their motion. 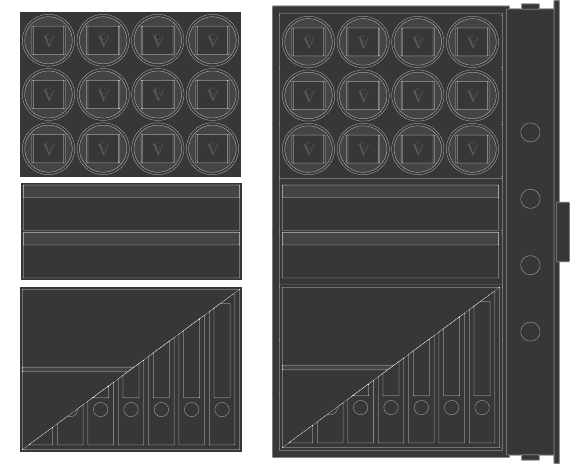 The Chronovision One is different: Here, the modules talk to each other. If you desire, they will synchronize their motion automatically for a harmonious overall experience. now also for watch winders. 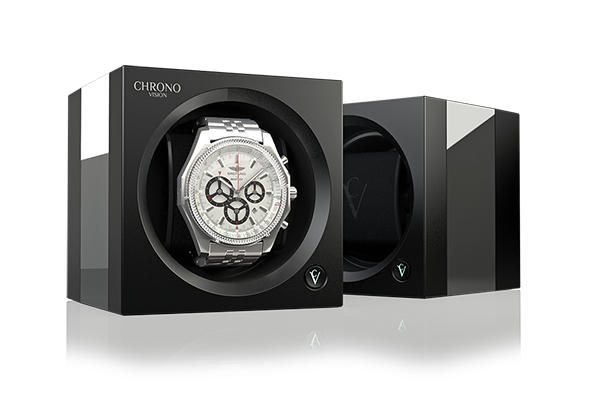 Operate your Chronovision One by plugging it in to the electricity grid. This way, you can supply electricity to six modules in series at the same time. Or use the battery mode. Depending on the chosen settings the battery power will last for overapproximately six month. 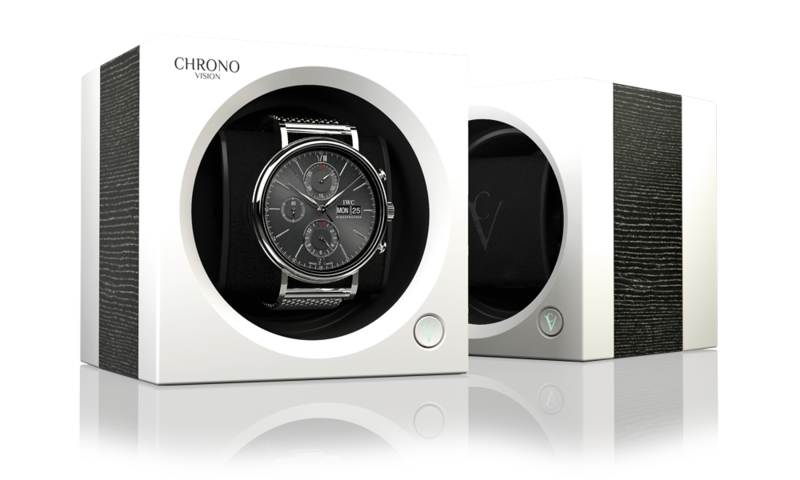 What is inside when “Made in Germany” is on it: Overview of the Chronovision One. The device is programmed via Bluetooth®, for example, from your smartphone or via the USB connection of your computer. The software for PCs and Macs and the app for iOS and Android save the settings you have already made. Customizable in over 40 varieties. Your collection seems to multiply by itself. We know the feeling and the satisfac tion it brings. It is what inspired us to create an elegant storage option that expands with your timepieces: The Chronovision collector box. Maybe you will start with one or two Chronovision One modules. With the third module, you will have already filled the front row of the collector box. Or perhaps you are a more advanced collector? You might already be filling the second row. If not, get ready to envision the models that will. Until the back row is filled, you can simply use the two practical shelves: at the bottom for jewelry such as rings or other fine items. The top shelf holds up to five watches with bands. You can see all of your favorite pieces at a glance through the windows at the front. Now, open the solid wood housing, feel the fine surface and experience the impressive presentation of the Chronovision One modules, bowing gracefully in their case. One of life’s small pleasures that rarely fails to put a smile on your lips. And when you open the case you’ll see them in the mirror, which is embedded in the fine velour on the inside of the lid. Now we can close the Chronovision collector box. LED interior lighting is accessible at the touch of a button to bathe your rotating watches in an elegant light. For up to 60 hours. 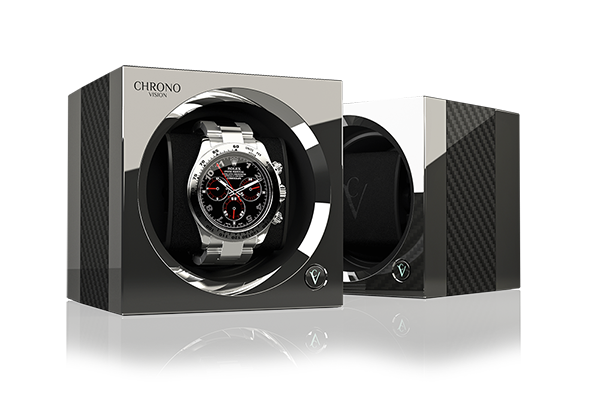 All that remains is to find out which of the four designs best suits your preferences: Black High- Gloss/Carbon, Black Silk/Carbon, Ziricote High-Gloss/Leather or White Silk/Ziricote High-Gloss. One relies on elaborate barriers. The other flies below the radar. The basic principle: value that goes unnoticed is hard to covet. That’s the principle behind the Chronovision Empire. When closed it simply looks like a decorative platform, perhaps a design piece or a sound system. Especially when a decorative object like a vase is placed on the top, which is finished in a special scratch-resistant glass. Who would dare to think that it houses so much more!? Its appearance is far from the dazzling image before your mind’s eye as you point the remote to open. Just seconds later – ssssst! – and the housing gently moves from 1.12 to 1.73 meters to reveal what you had been picturing all along. 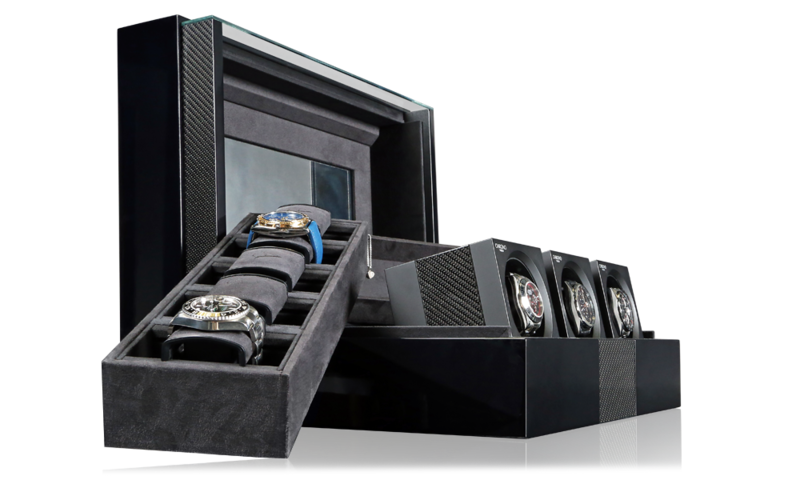 The top compar tment alone can store up to nine watches and other valuables, all nearly at eye level. 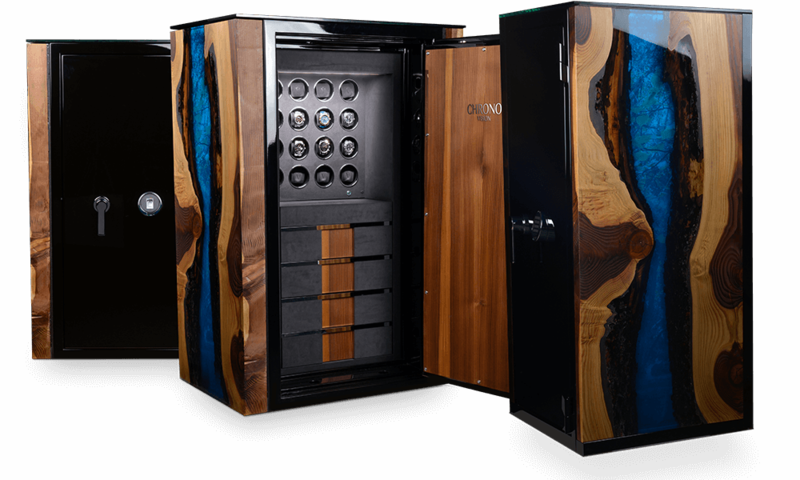 Eight or even 16 rotating Chronovision One modules can be stored at the next level below. Continuing down and separated by a special glass layer, additional items of value can be stored in a separate drawer. Subtle LED lighting will be reflec ted in your gaze. Everything is exactly where it needs to be. Still thinking about the sound system? Good, because we can do that too. USB and Bluetooth are integrated as standard interfaces. And you have probably realized that they enable easy control of your Chronovision Empire with your iOS or Android phone or your computer. 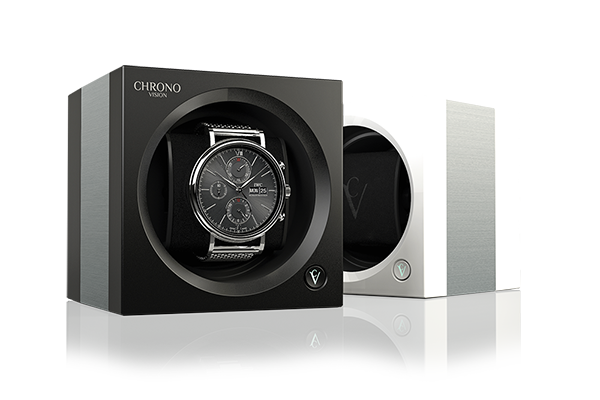 Just like you have come to expect from your Chronovision One modules. 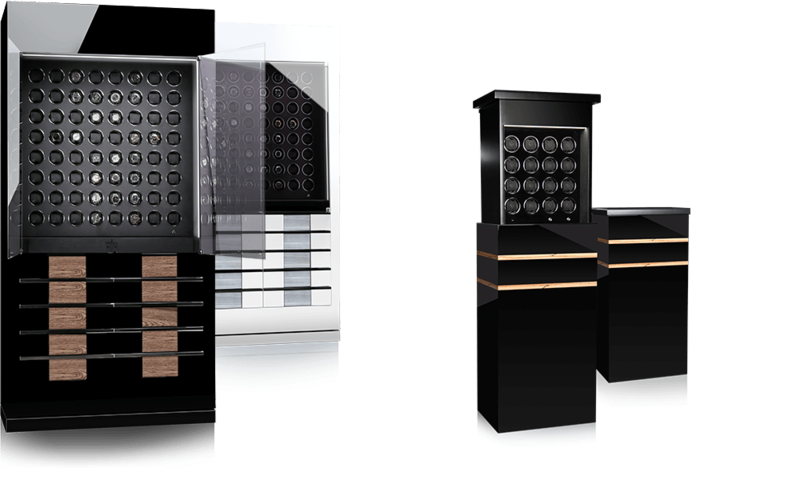 Enjoy the new combinations of surface designs, materials and colors – from Black Silk/Carbon to White High-Gloss/Natur Oak and Ziricote High-Gloss/Leather to White Silk/Walnut Silk. Which Empire will you choose? 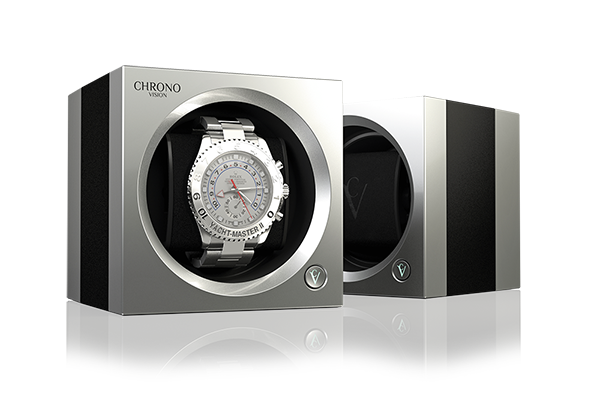 We can start with size, security class and design: Where will you store your Chronovision safe? 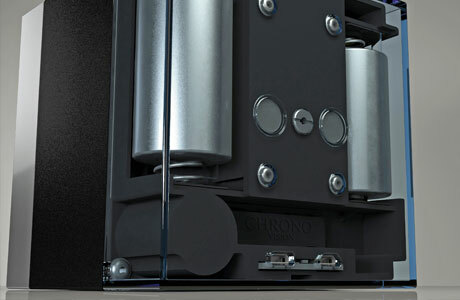 You define the dimensions, surface and colors to match the safe’s surroundings. And then there are extras like gold-plating on the lock and bolts or the electronic fingerprint scanner with mechanical revision. Continue your good taste on the interior. Would you like an elegant velour lining or genuine leather with diamond-patterned embroidery? How about bi-color design and LED interior lighting with an automatic switch? Let your ideas guide you for a safe that is all your own. Feel free to call us at +49 23 53 / 66 62 255. 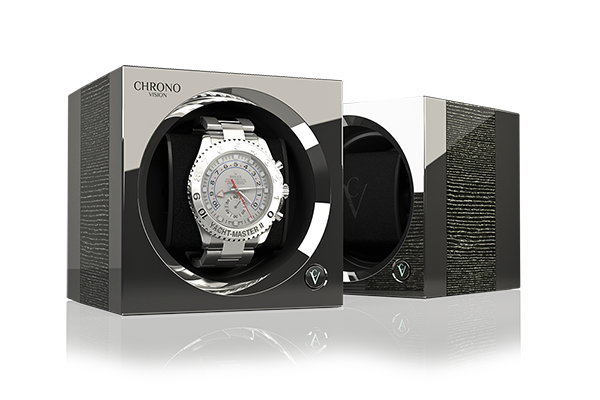 Jan Heiße, Managing Director of Chronovision, will take discuss your needs with you personally. the perfect formula for your Chronovision safe. 3. A lock with keys, a electronic lock or a fingerprint scanner? 4. Design, materials, color: Your wishes, please. 5. How many watch winders and drawers? Bi-color? Which showcase module? It’s all about your options.